For our penultimate Style for Your Shape post, we'll be talking all things Pear! As we always say, this feature is not so much about size as it is about shape, and it's completely possible to be a plus-size pear or a skinny one. No matter how much weight pear shapes gain or lose, they tend to have a slimmer upper body in proportion to their lower half (where they carry their weight). 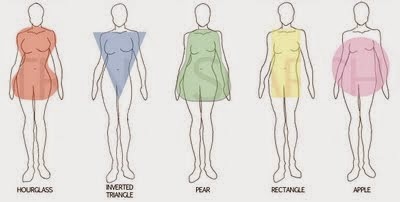 If you're unsure which of the five body shapes you have--Apple, Hourglass, Inverted Triangle, Pear, or Ruler--you might find this quiz helpful. But if you know you're a definite pear, read on! When it comes to choosing figure-flattering pieces, you want to bring the attention to your tiny waist (the envy of many other body shapes!) and slim upper body. Pick clothes that will enhance your best features, and conceal or skim over those you're more self-conscious of. This shape of coat will show off your small waist and give you an hourglass figure. And with your smaller bust, you don't have to worry about excessive buttons or pockets making you look too bulky up top. When it comes to dresses, look for styles that have interesting details around the neckline, and a simple, flared skirt. Many figures can look bulky in oversized tops, but this is one look you can pull off when worn with slim fitting jeans or leggings. A classic, horizontal-striped top is a perfect way of balancing out your proportions by widening your upper half. When it comes to buying bikinis, you're the lucky type who can pull off even the most skimpy, ruffled, bejewelled tops that would look ridiculous on bustier girls. Because you've got a wider lower half, keep your bikini bottom simple and solid-coloured. A pair of flares in a classic dark wash are not only on-trend: they balance your hips in the most flattering way. Because you've got a smaller bust, statement necklaces look fantastic on you, and you can afford to go all out with the kind of huge pieces that would be unflattering on someone bigger up top. Your most flattering style of skirt is the classic circle/skater/flared: it highlights your waist and glides over your hips and thighs. Dainty, strappy tops look fabulous on you--they highlight your delicate décolletage and slim arms. We are two twenty-something, Irish-born, Canadian-bred sisters with a love for fashion, food, travel and home decor. Ali is an Aries brunette who enjoys old books, lace dresses, bright lipstick, hot chocolate, thunderstorms, ghost stories, Thai food and daisies, while Vicky is a Virgo blonde partial to cutesy animals, snowy wonderlands, diet Coke, warm bread, stripes, candles and meticulously applied winged eyeliner.